Enjoy the taste of a Chicken Caesar Salad this summer. 1. Fill a small saucepan half way with water. Place the saucepan on a medium heat on the stove top and bring water to boil. 2. 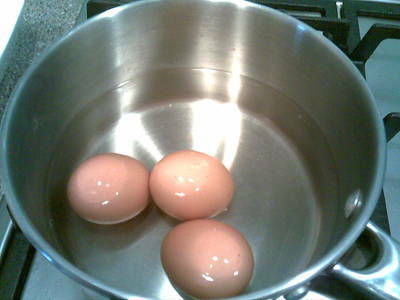 Place eggs in the boiling water using a spoon to lower them into the water so the eggs do not crack and boil for 10 minutes. 3. Wash the lettuce and cut into strips. Evenly place the strips of lettuce on two plates. 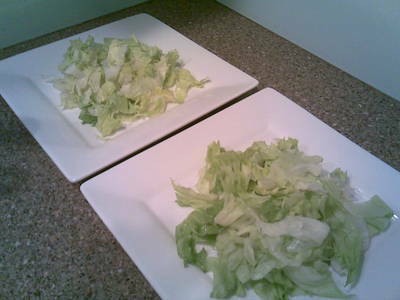 Place the lettuce strips onto plates. 4. 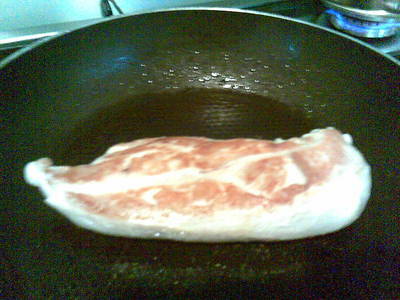 Place a drop of olive oil in a fry pan and place on a medium heat. 5. Add the whole chicken breast to the fry pan and cook on either side until brown and cooked in the middle, approximately 15 minutes. Brown both sides of the whole chicken breast. 6. Cool cooked eggs with some cold water and peel the eggs. Place the eggs in a bowl and put in the freezer to cool them down for 5 minutes. 7. 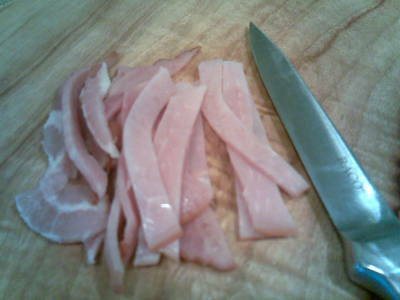 Slice the bacon into strips and remove any excess fat. Remove excess fat from the bacon. 8. 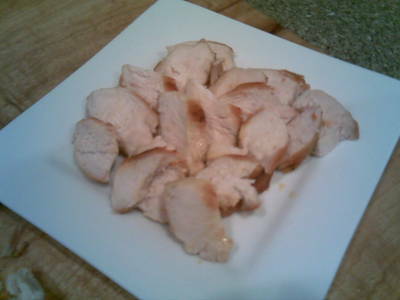 Remove the cooked chicken breast and place on a plate to rest. 9. Wash the fry pan and heat again with a drop of olive oil to a medium heat. 10. 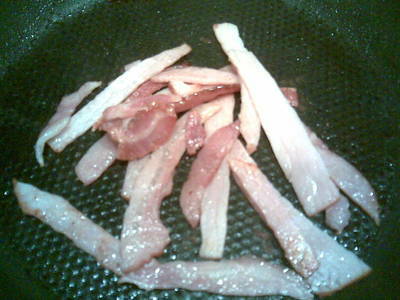 Add the bacon strips and cook for approximately 2-3 minutes. Cook strips of bacon for 2-3 minutes. 11. Place bacon on a plate to cool down. 12. Remove eggs from freezer and cut into quarters. 13. 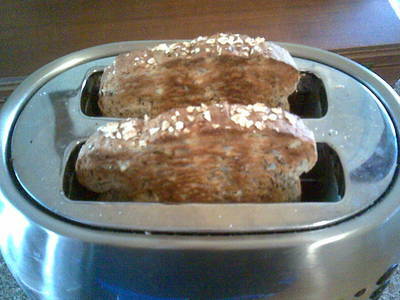 Place two pieces of bread in the toaster and cook on the highest setting to ensure the toast is hard just like a crouton. The quickest way to make croutons is to cook your bread on the highest setting on your toaster. 14. Cut the chicken breast into slices. 15. Use a bread knife (serrated edged knife) to cut the toast into small cubes to make croutons. 16. Mix the mayonnaise with water and stir until mixed through evenly. 17. 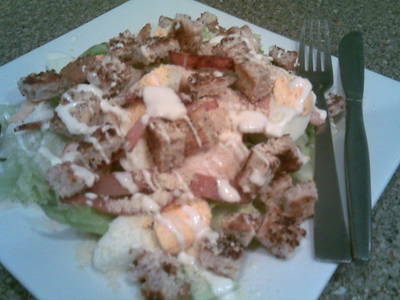 Assemble the salad starting with placing the chicken on the lettuce, then the bacon, eggs, parmesan cheese and croutons. 18. Drip the mayonnaise dressing over the top of the salad with a spoon, evenly distributing it all over the salad or to your desired taste. 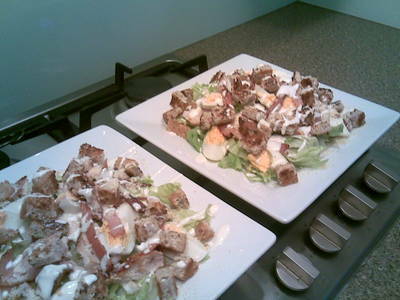 Chicken Caesar Salad - assembled and ready to eat.